I have my own microfibre travel towel as does my husband and both of the children. We’ve been travelling with them full-time for the last 4 years and before that we’d take them on shorter vacations and use them for sports, for visiting the pool, we even use them at home. They’re smaller to pack, smaller to store, easier to wash, quicker to dry, antibacterial and generally all round fabulous. I honestly don’t know why people still buy regular full-size towels, they’re that good. 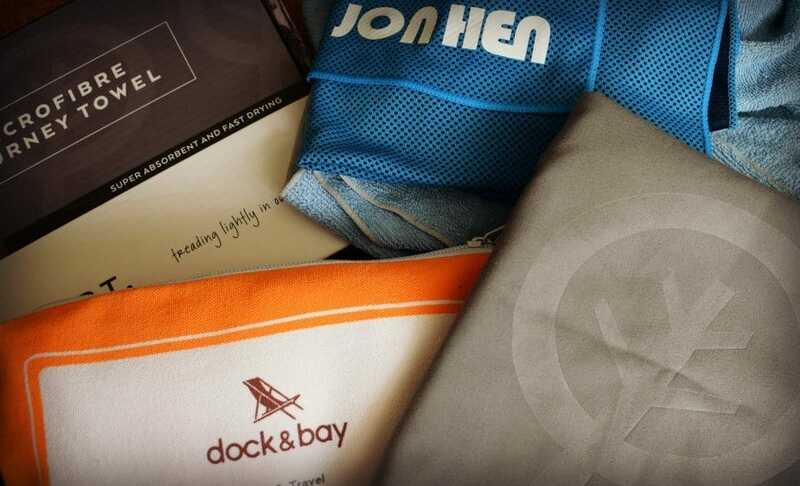 We took a look at what’s on the market ( including microfibre cooling towels) and review a few of the best makes and types to help you choose the best travel towel for you. All of our microfibre travel towels, for a family of 4, for travel, for sport, for life, take up less room and weigh less than 1 standard bath towel. What Size Travel Towel to Buy? This choice is heavily influenced by gender and by proposed use. My husband is more than happy with a tiny towel to wrap round his waist, these towels are supper efficient at drying so size isn’t really a consideration when it comes to absorbance. As a woman I like a larger towel to wrap right around me from armpit to knees. I also have long hair so to wrap and contain it effectively after a shower I do need a second, not quite so large, towel. The size you buy for your children will be dependent on their age and gender, medium should be adequate for boys, larger for teenage girls and up. 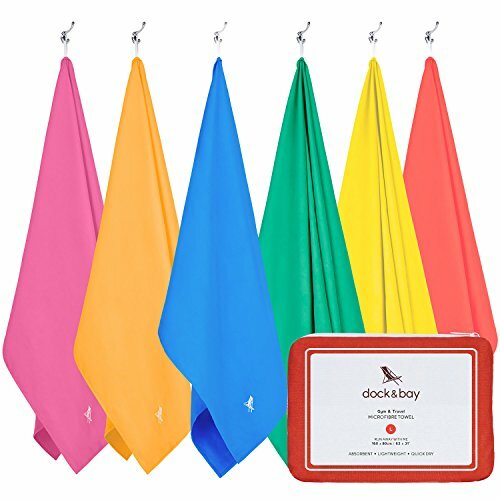 Some microfibre travel towels come in small medium and large, others come in a good range of accurately measured sizes. We’ll highlight some for you below. Best Blog Read Now! Best Travel Neck Pillow That Could Work! If you’re packing ultra light, maybe travelling carry-on only, you’ll want to minimise size and weight. These microfibre towels are all small and weigh little, but some are significantly heavier than others. Typical weights are 200- 300g for a large size. Know your maximum weight allowance for your airline, these do vary dramatically. Are Microfibre Towels Environmentally Friendly? Microfibre is an incredibly fine synthetic fibre which can be found in multiple products these days. A micro fibre towel dries four times faster is six times lighter and takes up a 1/8th of the space of a similar size standard towel. These towels seem to be very much a towel for life. As mentioned, some of ours have been heavily used for 20 years retaining their looks and functionality. I’d say that was a big advantage. Unfortunately they are not bio degradeable and they are made from non renewable resources . Like most things, it’s a compromise, nothing is a perfect solution to saving the planet. They come out of the washing machine almost dry, so if you’re the sort to use an electric dryer, no more tumble drying huge heavy towels and wasting the planet’s resources that way. Micro Towelling or Micro Fibre Suede Finish? 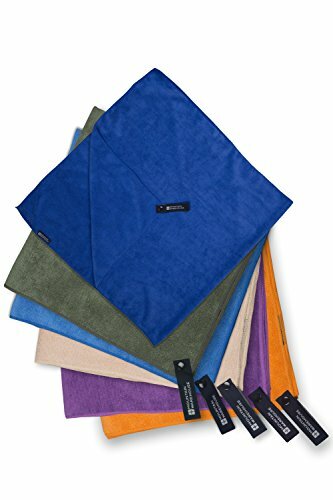 The majority of the microfiber travel towels on the market today come in a soft suede finish. Some have a luxury feel, others are too stiff. The Eco Dept towel below has the nicest feel of any that we tested. Towelling finish ( micro towelling) is also available it has similar properties to microfibre but a more traditional feel. We own some of these too, they are almost 20 years old and still going strong! Our winner for this year. The softest, lightest and most luxurious of the microfibre travel towels we tested, plus free hand towel or mat. The softest, most luxurious feel of our selection. Comes with a free, small (60 x 38 cm) hand towel. Brilliant! The soft grey is a lovely choice, also in hot orange and green. Embossed Eco Dept logo adds to the luxury image. The 132cm x 81cm ( 52 x 32 inch) size, wraps around me with full armpit to knee coverage. This is a new purchase, but quality seems excellent. This towel costs just a couple of pound or dollars more. Ribbon hanging loop with snap fastening. 215 g, weighed by me. Mountain Warehouse Microfibre Travel Towel in Micro Towelling or Standard. An old favourite of ours we own a Mountain Warehouse travel towel in Large and Extra Large. We have owned multiple travel towels from Mountain Warehouse for 3+ years, they’ve been used and laundered almost daily, have not faded and are good as new. These were our least favourite, lovely colours, but stiff and heavy. Not well suited as a microfibre travel towel but nice for seaside or beach use. They also come in stripes. Comes in a neat canvas and mesh zip bag. A big range of strong, vibrant colours. The embroidered Dock and Bay deck chair logo says “summer holiday”. Edges are hemmed rather than overstitched. The Large at 160cm x 80 cm ( 63 x 31 inches) is plenty big enough, from armpits to knees. Extra Large also available, Large is plenty big enough for a beach towel. 308 g weighed by me, excluding bag. I saw these cooling microfibre towels while I was researching travel towels and one just flew into my shopping cart. They cost almost nothing and they work ! You simply wet them in room temperature water, dry them slightly by squeezing and snapping, and they stay really cool for hours. Great for after or during workouts, including running, or for menopausal flushes. Also good for any tropical climate. 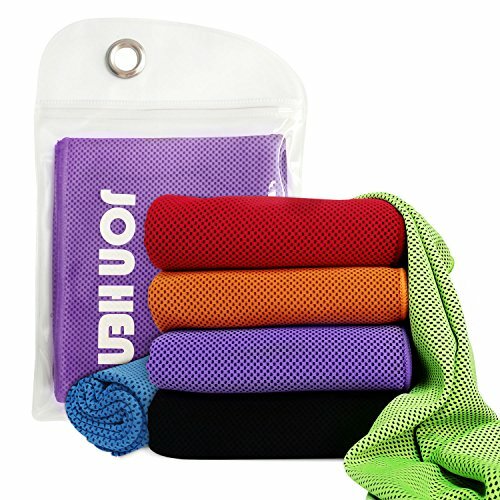 Another style of microfibre travel towel, the cooling towel, really works, is tiny and has a multitude of uses. Which Microfibre Travel Towel For You? 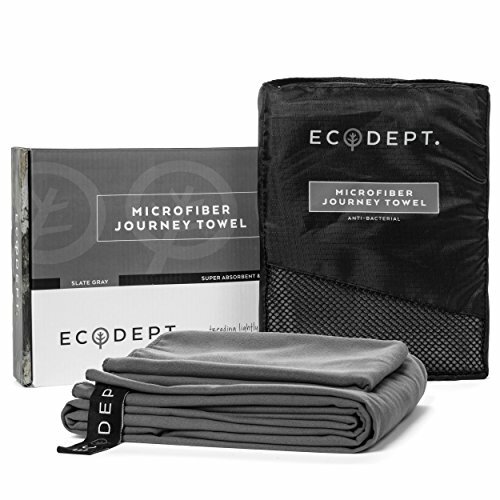 Our pick is the EcoDept, it wins by a long way, but the Mountain Warehouse towels are solid performers too. Just pick your size, pick your colour and pack your bags. Happy towelling! So good for the menopausal flushes – which thankfully I’m almost done with now. Hi Suzy ! Very useful, Alyson – I was about to buy a few myself for our next trip (Costa Rica) – these cooling towels sound neat ! First time I hear about them! Thanks for sharing!! !